CAIRO Egypt's ousted leader Hosni Mubarak, wearing a white shirt and loafers while flashing a smile, was released from prison Thursday and transported to a military hospital in a Cairo suburb where he will be held under house arrest. Prime Minister Hazem el-Beblawi had ordered that Mubarak be put under house arrest as part of the emergency measures imposed this month after a wave of violence sparked by the ouster of Islamist leader Mohammed Morsi, who had succeeded Mubarak as Egypt's first freely elected president. Footage on private TV stations showed the helicopter carrying the 85-year-old Mubarak landing at the pad outside the military hospital, which sits on the banks of the Nile. He was immediately transported to an ambulance and moved across the street to the hospital. 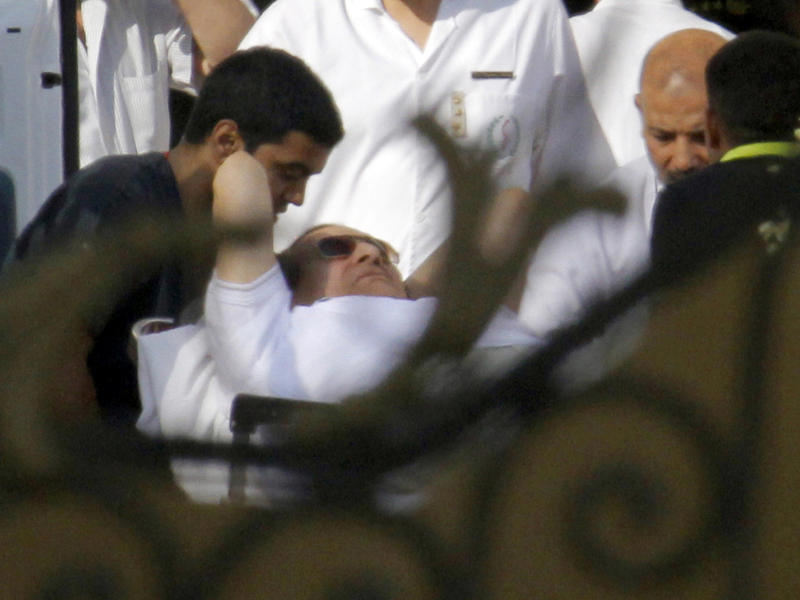 An Associated Press photo shows Mubarak on a gurney being transported onto an ambulance amid tight security. He was wearing sunglasses and dressed in a white shirt, beige pants and white loafers. He flashed a smile and held his arms behind his head while medics pushed his gurney into the ambulance. As the ambulance drove across the street and into the main gate of the military hospital, guards, some with their handguns drawn, and soldiers ran after the vehicle, possibly for fear that the ex-president could be the target of an attack. Thursday's move followed a court decision ordering Mubarak's release in relation to charges of receiving gifts from a state-owned newspaper. The release threatened to stoke the unrest as the Arab nation is already roiled in a crisis over a military coup against Morsi. But the decision to place him under house arrest instead of letting him go free appeared designed to ease some of the criticism over releasing Mubarak and to ensure that he appears in court next week for a separate trial. Despite his release, the 85-year-old ousted leader still faces retrial on charges of complicity in the killing of protesters in the 2011 uprising against him, which could put him back behind bars. His court case resumes next week. He also is being investigated in at least two other corruption cases. State TV said a medically equipped helicopter transported Mubarak to the military hospital in the southern Maadi suburb. Mubarak was held for several weeks of his two years detention in the same hospital as he underwent medical check-ups. His lawyers had cited bad conditions in the prison facilities. Prison authorities had renovated a ward where he was later kept. Since his ouster, Mubarak's supporters have released conflicting details about his health, including that he suffered a stroke, a heart attack and at times went into a coma. His critics called these an attempt to gain public sympathy and court leniency. His wife, Suzanne, has been living in Cairo and keeping a low-profile, occasionally visiting Mubarak and their two sons in prison. The prospect of Mubarak being freed, even if only temporarily, would feed into the larger crisis bedeviling Egypt: the violent fallout from the July 3 coup that unseated Morsi.